If you owned a seven-seat SUV, would you take it around the Nurburgring? We suspect the answer might be no, but it’s handy to know that the upcoming SEAT Tarraco will hold its own through the fast and varied corners of the ‘Ring. 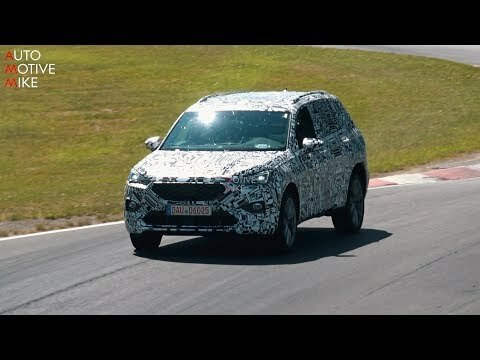 In a video taken by Automotive Mike, the Tarraco is in a camouflage wrap and is being put through its paces. Nurburgring hot laps are common to test a car’s dynamics before it’s officially revealed to the public and press, even on a car that won’t see many racetracks in its lifetime. Styling details can be seen through the camouflage wrap, including a large grille and angular LED headlights. We reckon the grille looks a bit like the Superman logo, especially with SEAT’s ‘S’ badge. In profile, the Tarraco will look quite similar to the Skoda Kodiaq because the two cars will share many parts. At the rear, slim and triangular lights are expected, joined together with a light strip across the bootlid. SEAT is the sporty brand of the VW Group, so you can look forward to a family-sized SUV that’ll still handle well. Due to its size, it’s unlikely to offer quite the same poise and quick steering as the Ibiza, Leon or Ateca, but it’ll probably take corners much better than you might expect from a seven-seat car. Leaked images suggest the SEAT Tarraco will have its infotainment touchscreen ‘floating’ above the centre console (not like the one built-in, shown in the photo here),but most of the switches, buttons and the steering wheel will be shared with SEAT’s other models. The flagship SUV will have features such as adaptive cruise control and dual-zone air conditioning available. SEAT will also equip the Tarraco with some of the same engines you can choose in the Ateca. A 1.4-litre petrol with either 125hp or 150hp could be the entry point into the range, which will also include a larger petrol engine and a 2.0-litre diesel engine with a couple of power outputs. An electrified version – probably a hybrid that uses the lower-output 1.4 unit – is also on the cards. The SEAT Tarraco is likely to be officially revealed before the end of the year, before going on sale in mid to late 2019.